In response to Israeli restrictions, Palestinian farmers have come up with a unique solution: Since building on land is prohibited, they build in trees. Mazen Saadeh faces a problem. In trying to expand the facilities of the campground and restaurant he manages in Beit Jala, near Bethlehem, he risks attracting the attention of the Israeli authorities tasked with halting Palestinian construction. Hosh Jasmin, the cooperative farm and tourist destination that Saadeh manages with his partner Aidan Pendleton, is located in the West Bank’s Area C, meaning it lies on Palestinian land under complete Israeli civil and military control. Area C and Hosh Jasmin are under full occupation, a situation that brings with it many challenges, including the threat of demolition. A restaurant just across the valley from Hosh Jasmin has been demolished by the Israeli military three times. In response, Saadeh has come up with a unique solution: Since building on the land is prohibited, he builds in the trees. Saadeh and volunteers at Hosh Jasmin recently completed construction on one treehouse, and they plan to build two more in the coming months. They have also built additional rooms on top of existing structures in a way that allows them to circumvent the language of the law. 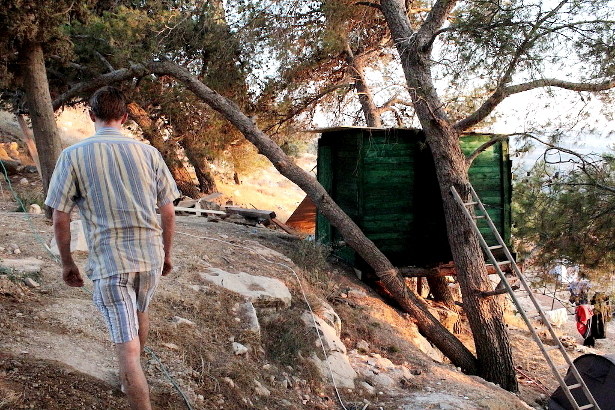 The treehouses will be used as rooms for visitors to stay overnight when they visit Hosh Jasmin. Currently, visitors can stay in tents for 50 shekels — around $14. Hosh Jasmin attracts a wide range of foreign and Palestinian tourists, and it was featured in the Israeli newspaper Haaretz last year under the headline “Growing Figs in a Place of War.” But Hosh Jasmin is more than a simple hotel. Taking its name from one used for shared spaces common in Syrian communities, Hosh Jasmin is meant to become a model community where food is produced on-site. In addition to the restaurant and campsite, Hosh Jasmin is home to a farm with 11 kinds of vegetables, as well as chickens, rabbits and sheep. Saadeh’s goal is to eventually serve only food produced on the farm, all grown organically. But the Hosh Jasmin project extends well beyond the production of healthier food. The volunteers, employees and owners of Hosh Jasmin are actively constructing a new model for life in Area C. Saadeh said an important part of that project is supporting Palestinian work; all of the food Hosh Jasmin buys is produced in Palestine. “Even the kind of beers we offer is the Palestinian one. It’s very powerful, I think. It’s all Palestinians, with Palestinian hands, with Palestinian farmers from Palestinian areas,” Saadeh said. Casey Asprooth-Jackson, an American who spent several weeks in Hosh Jasmin and helped construct the first treehouse, had previously worked with a community-supported agriculture project in Upstate New York. He explained what he sees as the similarities and differences between agricultural projects in Palestine versus the rest of the world. The demographics of Hosh Jasmin’s employees reflect a commitment to improving life under occupation. All seven of the employees come from Palestinian refugee camps in Bethlehem, Nablus and Qalandiya — areas where it’s often difficult if not impossible to secure a decent job. Alaa Qsass, a Hosh Jasmin employee from Dheisheh refugee camp in Bethlehem, said there are two reasons he prefers working in Hosh Jasmin to working in the camp. Despite the advantages of working at Hosh Jasmin, Qsass said, there are also difficulties and dangers related to the farm’s status in Area C. “There’s danger to working in Area C. Some nights we worked here, and the Israeli police came and took photos of us. And sometimes they stop us when we come here and ask us questions,” he said. Another employee at Hosh Jasmin, Jehad Afaghani, was born in Balata refugee camp in Nablus and spent four months working on the farm. He said he thinks Hosh Jasmin represents a model that could be exported to other parts of Area C to improve living conditions around the West Bank. How are photographs and security checks considered “dangers”? We are a number of volunteers plus launching a whole new structure in our community. Your web site provided us with helpful facts so that you can work on. You must have done any powerful practice along with our complete local community will likely be fortunate to you personally.